This program displays Thumbs.db and Thumbcache_*.db (Vista,Win7) database records as well as the miniature graphics contained in each; collects all the Thumbs.db files in and below the specified folder; create reports, PDF; thumbnails search. 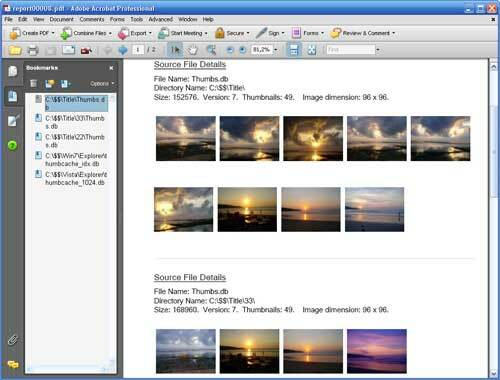 AutoCDView is a thumbnail style image file viewer to be included on CD media.Include it on a CD along with your images. Then, when the CDis inserted, up come thumbnails of your collection! VERY easy. Royalty free for personal use! Exif Farm - software for viewing, creating and editing EXIF information. Being integrated in the system, the program gives an access to Exif data in most of applications. MegaView is a comprehensive viewing solution that supports all common image, multimedia (AVI, MPEG, MP3, etc), text and Office formats. It`s advanced viewing features are matched with file management and information distribution functionality.